Ever since De Beers introduced the three-stone diamond ring, this particular design has been hugely popular – and rife with meaning. Some couples say the three diamonds represent their lifetime together, with one diamond for their past, present and future. Others say it represents the Holy Trinity and the religious bond of a married couple. For couples who already have a child, each diamond can represent a member of their family. A Quick Note: Does Size Matter? When shoppers head out in search of a three-stone diamond ring, the first problem they run into usually has to do with size. Because the ring has three large stones, instead of the traditional one, standard carat weight guidelines may no longer apply. Although you do want the diamonds to take up a significant portion of the real estate on her finger (either by width or height, depending on her hand size and shape), you don’t want the ring to be too large, as it may end up looking gaudy or, even worse, fake. Most women consider anything around 2.5 carats as “big,” while the average size for an engagement ring is 0.75 carats. Keep this in mind when deciding on the size of the larger stones in the ring. 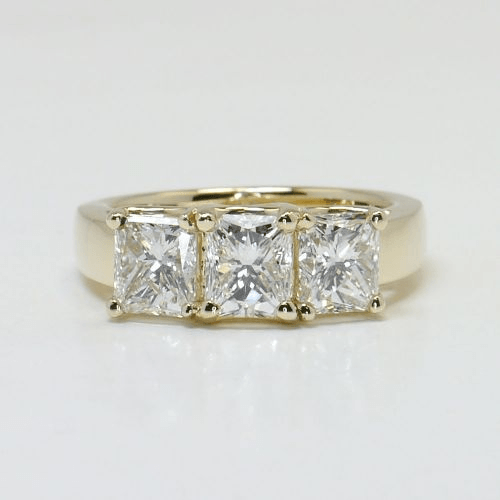 The key is to find the right proportion between the two larger side stones and the center stone. To make the center pop and look exceptionally large go with a little smaller size for the side stones. If you want to create a stunning, solid surface of diamond, then opt for three diamonds that are larger and similar in size. To get a rough idea of what each carat size looks like, check out our Diamond Size Chart, which breaks down the average carat to mm ratio for each diamond shape. 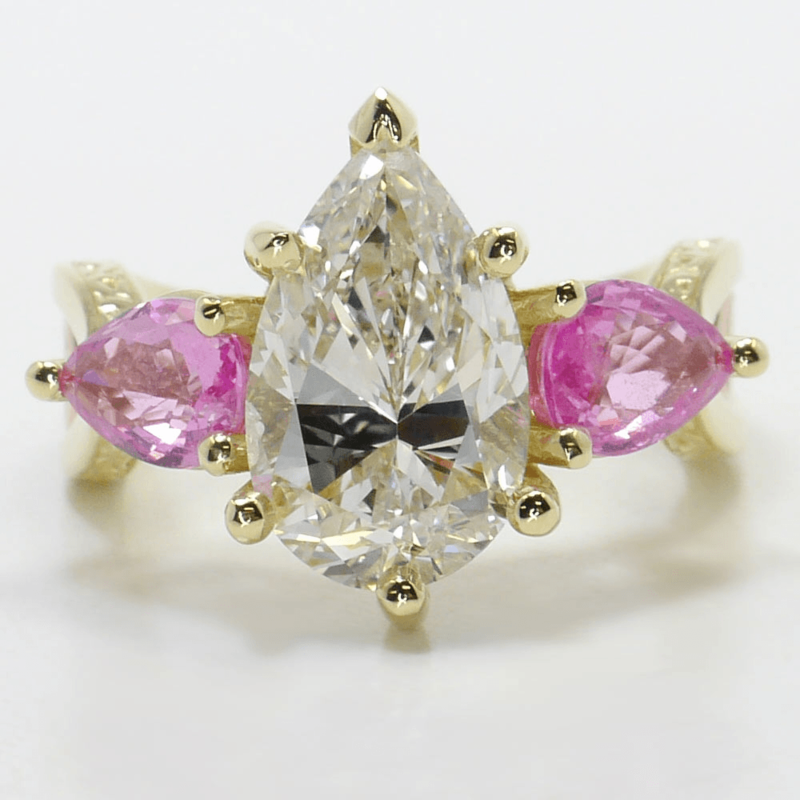 The original three-stone diamond ring looked similar to the ring above, with perfectly matched, slightly smaller diamonds bookending the center stone. The result is a gorgeous, timeless look with lots of sparkle. 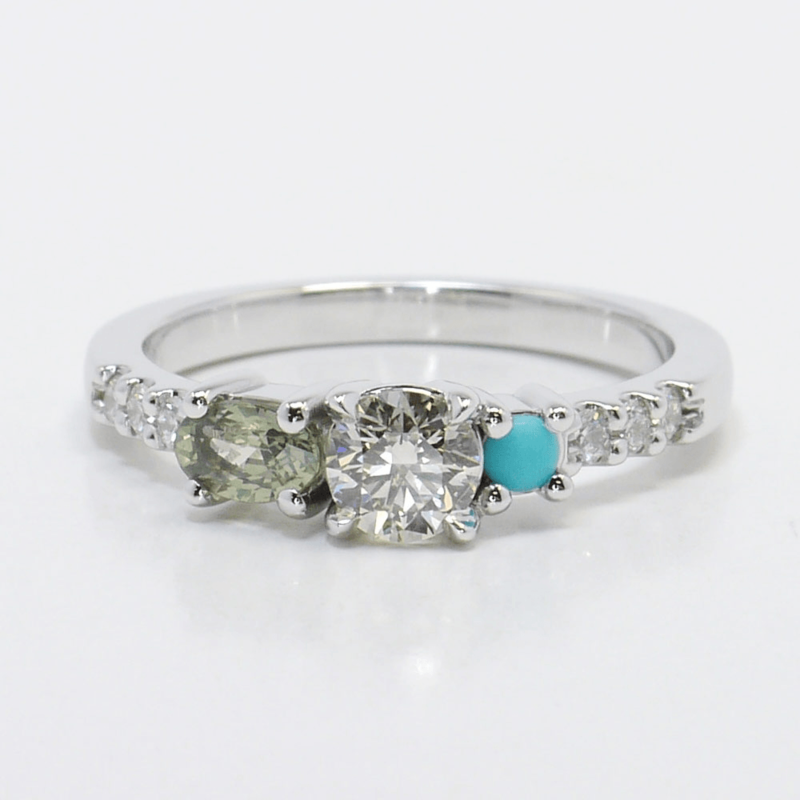 If you do opt for this three-stone setting, take care to find accent diamonds (or accent gemstones, if you want that pop of color) that are the right size. 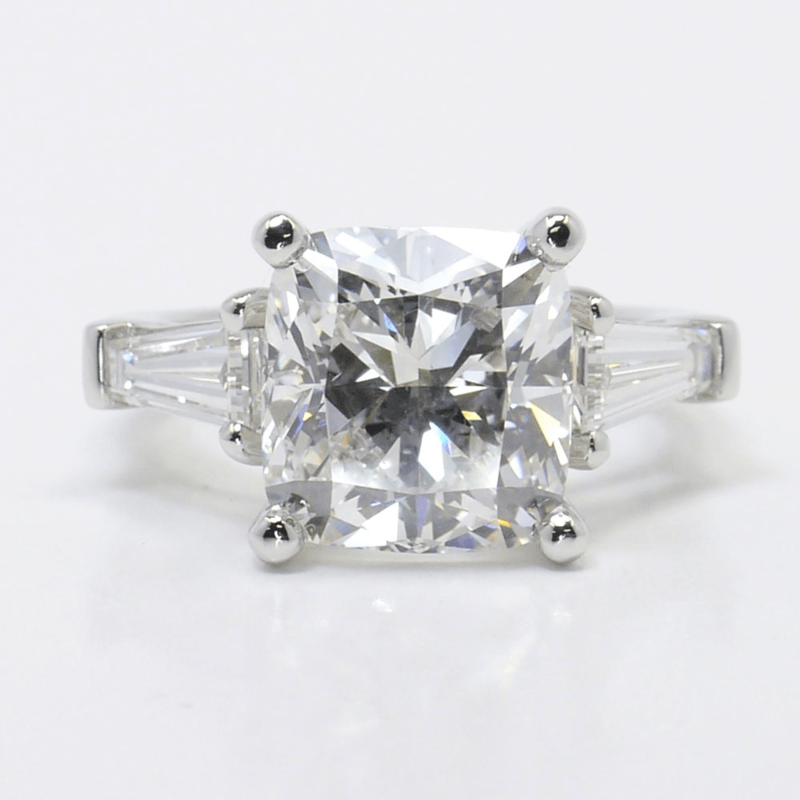 This smaller side stone design usually features accent diamonds that are between one half and one third of the center diamond’s size. 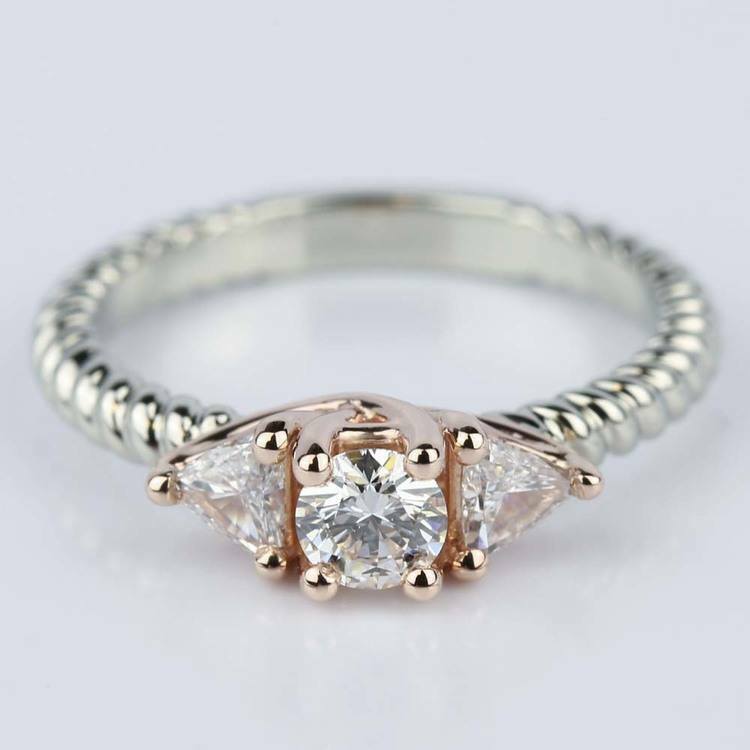 But of course, jewelry is always subjective, so take a look at trios of varying ratios until you find the one that will best suit your future bride. It’s not difficult to see why three-stone engagement rings have been so popular over the years – they’re incredibly beautiful. But there’s another reason for the style’s enduring popularity. Three-stone diamond rings can be a way to give the woman you love something extra special without breaking the bank. 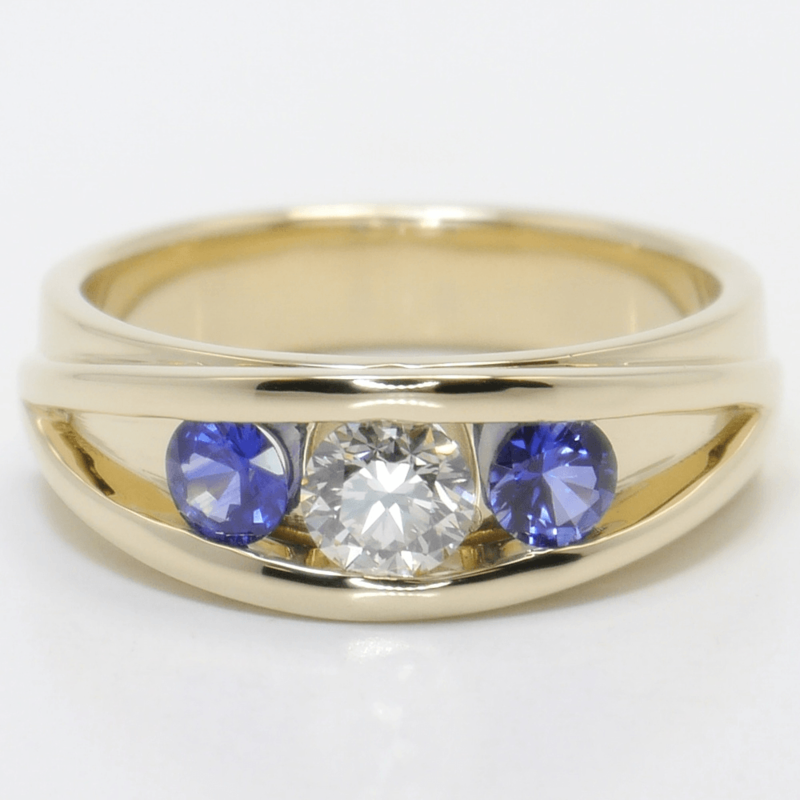 In fact, a three-stone ring can be a great solution for couples on a modest budget. The smaller stones tend to cost less, but can still make for a great display once they’re all set in a ring. You can achieve this brilliant design with a variety of styles, too. As we mentioned earlier, some couples add gemstones like ruby or sapphire to their three-stone ring, in lieu of accent diamonds. This option is both cost-efficient and quite beautiful! Another way to achieve the three-stone look is to try out different shaped accent diamonds. 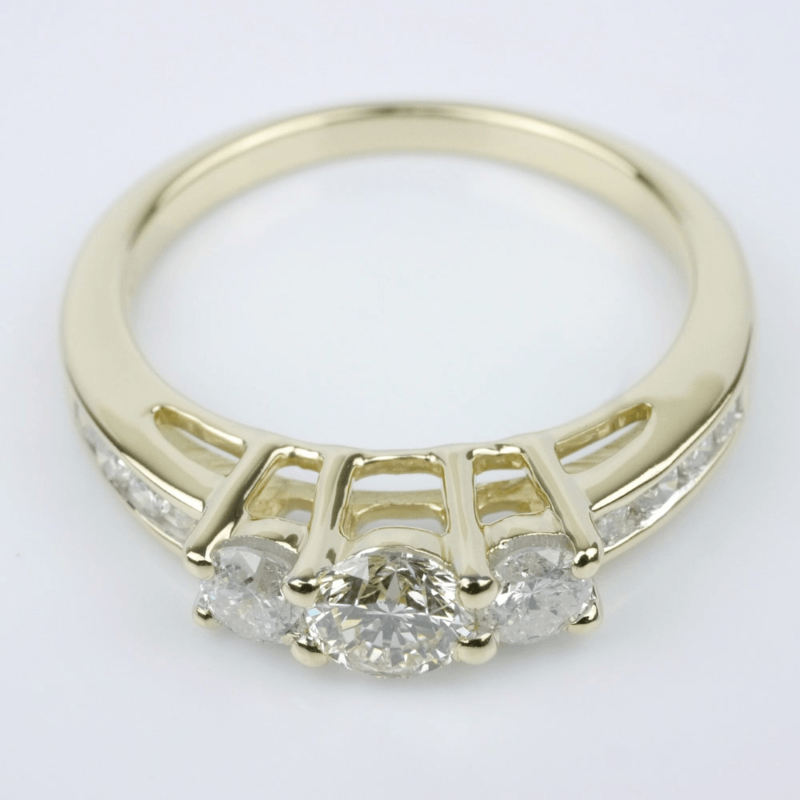 For example, the baguette cut diamonds featured above look stunning! The tapered baguettes complement the center stone beautifully for an extra sparkly upgrade on the traditional solitaire engagement ring. If baguettes aren’t quite right for the love of your life, then give trillion cut accents a try. This style pairs your center stone with two triangular diamonds set on either side.The trillion stones are brilliant and unique, but the straight edges look best with other straight edge stones, so consider the center stone you’ll be using. The truly individual couples will take the three stone concept and make it their own. Mixing up shapes, colors, and setting styles. There are no limits to the three stone design, and even with the basic guideline of three stones, the options are endless. 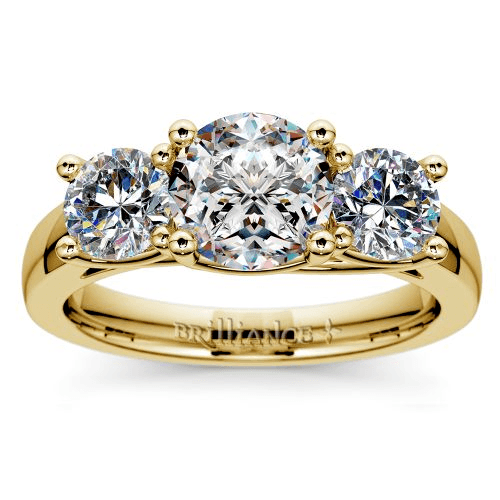 The three-stone ring is a beautiful, romantic choice for an engagement ring. 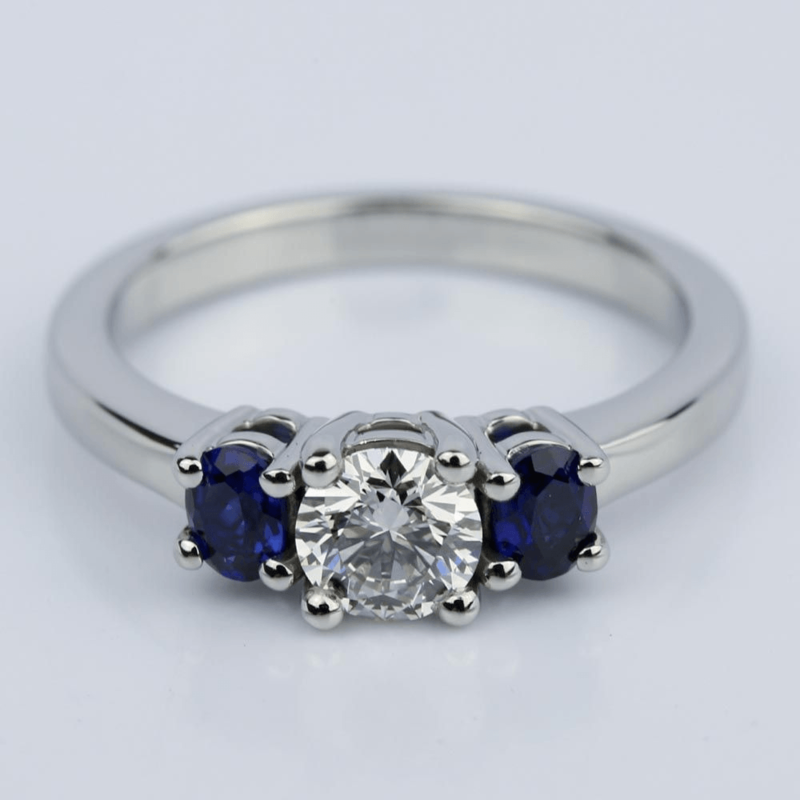 And, thanks to the variety of style, stone, and size, it is a ring that can suit anyone – no matter what they can afford. 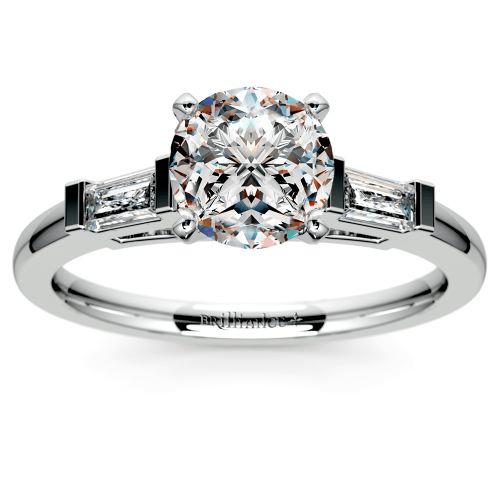 As you continue your search for the perfect engagement ring, remember the three-stone diamond ring. It might be just what you need to seal a love that spans the past, present, and future.